Wow! Our first week is over and we’re delighted with how many people have come to find us. We want to run as a studio/gallery so that we can develop our work and talk to visitors about the paintings and prints we have on show. 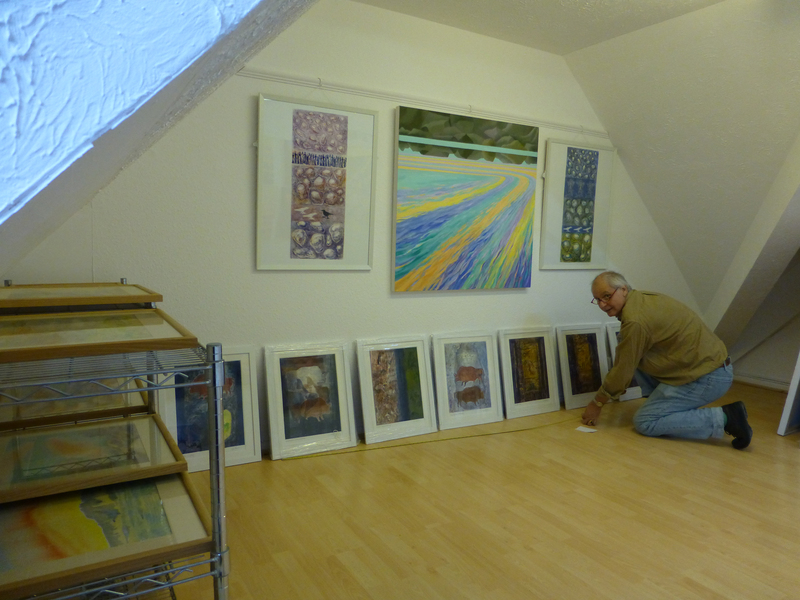 We showed some older work alongside the new – here’s Paul fixing my recent monotypes of prehistoric caves under my big oil painting and earlier composites. We realised that we’ve set up the ‘gallery’ part, but have very little of the ‘studio’ part in place yet, so that’s what we’ll be arranging next. We’ve also been asked to do talks to groups, workshops with art clubs and have professional conversations with people returning to art after a gap or feeling ‘stuck’ in their personal art practice. So we’ll be busy! Lots to think about too – having a town-centre studio/gallery is a new venture for us both and we want to explore the range of options it offers to extend our own practice in interesting ways. Previous PostOpening next week!Next PostIt’s the last week already!